Lincoln’s visit is giving me the excuse and opportunity to play the tourist here in Atlanta. Over the last couple of days, we’ve visited the World of Coca-Cola, The Varsity, Emory’s campus, and the Decatur Arts Festival, as well as checking out several restaurants (Savage Pizza, La Fonda, The Porter...yum!) and going to the movies. 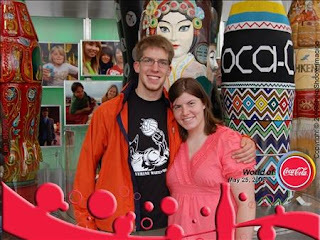 Above is a photo from the lobby of the World of Coke, where we tasted 60+ varieties of Coca-Cola and other Coke products from all over the world. I definitely enjoyed the ginger sodas from Africa. Stoney Tangawizi rocks! We also shot film both today and on Sunday at the Arts festival to make a short movie, and the results of that will be posted eventually. Come back and check it out!